I had no idea how to call it. We normally eat it spread on a ham or cheese sandwich. It's also great as a side dish with meats. But I definitely know that there can't be Christmas or Easter without it! I just can't possibly imagine a holiday breakfast without this aromatic paste on the table... Hope you will try it too, it's dead simple. Especially now during carnival season - it will work great as a kind of dip/side dish with small canapes or vegetable sticks etc. My Hubby made me a beautiful lunch today. The ingredients are really only for one big portion (if you want more just take 2 chicken breast and double rest of the ingredients accordingly). I would say this will be perfect served with pasta - for ex. spinach tagliatelle - I had it with pearl barley and it was delicious! Hope you will try it - sometimes my Hubby is a culinary genius :) and today was one of those days. Merry Christmas Everyone! and I've got NEWS for you!!! As you know I have had a secret for some time now. I promised I will share it with you and what's a better time then Christmas!? Wesołych Świąt Bożego Narodzenia! Merry Christmas! Joyeux Noël! Frohe Weihnachten! Καλά Χριστούγεννα! Nollaig Shona Duit! Buon Natale! С Рождеством Христовым! Feliz Natal! Feliz Navidad! 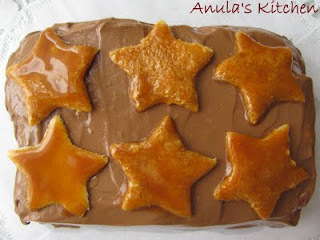 Some of those recipes you can find on my blog already, some of them will be added later. So without any further delay - I'm going to enjoy my feast. Have a nice evening and if you're Polish - Wesołych świąt! Another festive recipe. It's not a soup as such, coz you will serve it after the meal as a dessert or mid-day snack. Polish almond soup - zupa migdałowa - is a creamy meatless soup that some families serve for Christmas Eve supper. It is usually served hot for Wigilia and cold at other times of the year (great for birthday party etc.). I have to admit that it was my first time ever making this dessert - although I ate it many times before. It was easy and the result is fantastic. Hope you will enjoy. P.S. Unfortunately on the photo you can't see all the almond flakes and raisins in the soup... shame. Nothing 'festive' this time, sorry guys ;) This is something which constantly reminds me my childhood. Generally in my family fish is widely eaten and there are many thing in which it's used. Smoked mackerel paste is one of them. I remember when I was very young I really didn't like it a lot... But growing older means (sometimes anyway ;) ) that you're getting wiser at the same time. It's dead simple and very nice on a piece of toast :) It will be great on a small toasts/blinis as a starter or finger food during a party. Of course I didn't have to convince anyone about advantages of eating fish (good fats Omega 3 etc.... ). Done, another thing I can cross off the list. 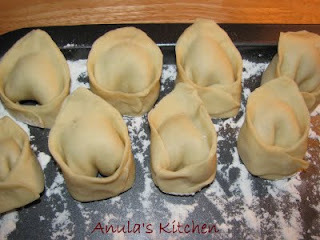 They are very easy to make but it's quite time consuming - forming those little ears. You can freeze them, once you cooked them slightly just cool them and to the freezer. Then when you want to eat straight from the freezer into salted, boiling water and ready to be served. For Christmas Eve in Poland, we make them with meat free filling - sauerkraut and mushrooms. I can't imagine Christmas Eve feast without them swimming in a bowl of lovely ruby barszcz (beetroot soup)! The November 2009 Daring Bakers Challenge was chosen and hosted by Lisa Michele of Parsley, Sage, Desserts and Line Drives. She chose the Italian Pastry, Cannolo (Cannoli is plural), using the cookbooks Lidia’s Italian-American Kitchen by Lidia Matticchio Bastianich and The Sopranos Family Cookbook by Allen Rucker; recipes by Michelle Scicolone, as ingredient/direction guides. She added her own modifications/changes, so the recipe is not 100% verbatim from either book. This month's challenge was very nice - and the result was very delicious. I didn't have a cannoli forms so I've made a square ones and sandwiched them. I also made another shape - as the recipe was very familiar to the Polish one for Faworki (traditional carnival sweet) I made some cannoli in faworki's shape. The 2009 October Daring Bakers’ challenge was brought to us by Ami S. She chose macaroons from Claudia Fleming’s The Last Course: The Desserts of Gramercy Tavern as the challenge recipe. I'm not lucky lately... First the operation (and to all those concerned about my health, everything is almost back to normal, just those ugly scars...) and now I got a flu! Luckily not the swine flu... I'm into comfort food, kind of warm and not too complicated dishes. This is quite popular in Poland, particularly in Silesia region - actually a little different version than mine but very similar. I used what I actually had in my fridge and cupboard. It's quick (besides baking...) and soo good. I know that it may not look too beautiful (and sorry for the quality of my photos...) but it tastes amazing! Hope you will try during, long, dark, cold winter evening. This month's DC challenge is hosted by Jaden from Steamy Kitchen. She choose the Vietnamese Chicken Pho and another additional recipe of Sweet Wontons (which unfortunately with my operation and lots of other things going on I didn't have a chance to make, but I'm going to do so!). The soup was very good indeed. It's perfect especially now, when the days are shorter and much cooler. It's very warming and have a nice kick ;) It's sort of 'comfort food' for me. I already wrote about how I eat my porridge (you can find it here) but I want to share some more ideas with you. That's how I eat it recently. As the days are shorter and weather is cooler (it's basically raining here constantly, it's really miserable...) I'm choosing what's 'comfort food' for me. A nice scent of cinnamon, apples, sultanas on a hot porridge - can you have a better start of the day? After some time of neglecting my blog, which had lots of reasons (my trip to Poland, surgery after which I'm still recovering and didn't have a strength to stand in the kitchen and cook or bake). Anyway, I'm back for good now and full of new ideas, with some new cooking books on my shelf and very eager to share all that with you. This mushroom sauce was actually made by my Dad, back at home. As it's mushroom's season there right now, mushrooms are everywhere and in quite reasonable price. We (Polish ;) ) love our mushrooms - pickled, fried, dried, sauce, soup, in a scrambled egg etc. Of course there's nothing better that your own hand picked mushrooms, but sometimes it's not possible so... you just go to the market and buy some. This mushroom sauce is great with plain mash, pearl barley, buckwheat, potato pancakes or courgette cakes (and that's what we had). I believe that each family has their own version of a mushroom sauce, this one is very simple and delicious, so I hope you'll try it! P.S. Just remember when you're hand picking your mushrooms - go with someone who knows mushrooms very well or... it can end badly for you. Mushrooms can be very poisonous and you have to be careful with them! So, as every month, on the very same day :) here we go: The September 2009 Daring Bakers' challenge was hosted by Steph of A Whisk and a Spoon. She chose the French treat, Vols-au-Vent based on the Puff Pastry recipe by Michel Richard from the cookbook Baking With Julia by Dorie Greenspan. I finally saw it! I went on a date - with my Hubby. He wasn't very keen at the beginning because of the movie itself (let's face it - it wasn't his first choice). But... he liked it a lot! He likes food, likes to eat and cook so I knew he will like it at the end. OK, so now my thoughts and my opinion about Julie & Julia ;) It's different, interesting and if you're 'foodie' - you can't miss it! I loved it from the very beginning :) It's funny, real (yes, we all have some 'accidents', better and worse days in the kitchen...) and it's full of gorgeous food! The life of Julia Child, the journey to become one of the most famous and loved cooks - I never knew lot of those fascinating things about her. You can 'feel' her passion, determination and fearless approach to cooking. She didn't believe in 'half-ways' - and that's also why I admire her so much! She made French food available to all of us - rich or poor, amateur or advanced cook, French or English - as long as you want, you will do it! She gave us basic 'tools', toughed what to do to be successful (not only in the kitchen...). Julie Powell - an ordinary woman living in NYC. Wanted to do something with her life, wanted to persuade her passion (writing) in a profitable career, so she doesn't have to work in a dead end job anymore. Her journey through "Mastering the Art of French Cooking" was amazing! She was determined, brave!, passionate - 536 recipes in 365 days! OMG, I don't think I could be such devoted and stubborn as she was! But, that paid off - she's realising her dream right now - she's a famous writer and a person to follow. She showed us that if you really want - you can. If you want to read the original blog it's here. I think that both lives, both stories are actually very similar. Both began from the love of food, both ended with a success! P.S. All photos from the official web site Julie & Julia. It's already this time of the month - time for Daring Cooks challenge! The September Daring Cooks challenge was hosted by Debyi from Healthy Vegan Kitchen. She choose Indian Dosas. I must admit that it was my first time eating Dosas, never mention making them! I love all kinds of pancakes, so I was very excited by this challenge. Also, I'm eating vegetarian dishes from time to time, but I've never eaten anything vegan. I must admit that I was very surprised how it turned out! When I was chopping, mixing, cooking I thought - OMG it will be bland and weird consistency... I was soo wrong!Lots of work - but worth it :) They were very delicious - everything! I have this 'phase' lately for making muffins. I have no idea where did it come from - but I like it and enjoy it a lot ;) As I had 2 big packs of Greek yogurt I thought of these little, fluffy things. I found this recipe in one of my many cookbooks - 'The cookie and biscuit bible'. 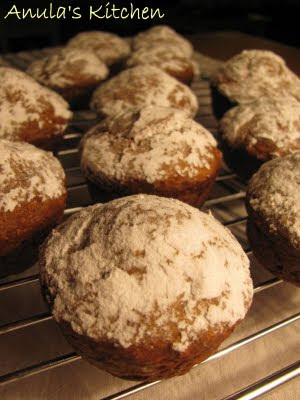 The are perfect for a nice breakfast, necessarily with a cup of coffee, or as a treat for lunch during busy day at work. The August 2009 Daring Bakers' challenge was hosted by Angela of A Spoonful of Sugar and Lorraine of Not Quite Nigella. They chose the spectacular Dobos Torte based on a recipe from Rick Rodgers' cookbook Kaffeehaus: Exquisite Desserts from the Classic Caffés of Vienna, Budapest, and Prague. This is very popular dish in Poland. No party, celebration (especially in Silesia and Mountain's region) can be without it! It's also traditionally served on the Christmas Day. I like it a lot. There are many versions of bigos - I would say that each family have their own, unique recipe. This is how my Hubby makes it - and it's great :) But I still miss my Dad's bigos - can't recreate it! It was my first time making Macaroni cheese - I wanted to try it for a long time though. Macaroni cheese is very popular in the UK and in the USA - where it's called mac'n'cheese. Its popularity in the USA has been attributed to Thomas Jefferson serving it at a White House dinner in 1802 - who knew it's origins go back that far?! Recipe for the famous macaroni and cheese couldn't be any simpler - just a white sauce, with a lot of cheese and macaroni cooked just al dente. But, I'm usually not the one to stick to the recipe and always looking for ways to change it, to make it "my own". As it happened I had a lot of broccoli which I had to use, I really hate food waste, but I'm pretty sure that other veges would work great too here - just think of artichokes, cauliflower, mushrooms or peppers! As it happens there were some cherry tomatoes sitting on the counter top too, looking rather miserable and waiting eagerly for their turn, so they too found their way into this, so not "traditional" at this stage, macaroni and cheese. Yes, I do know I'm not using the traditional macaroni pasta here either, but have you seen the price of it?! Half a kilo of macaroni shaped pasta costs more than a 2 kg pack of the one I used! I simply can't see a reason big enough to justify using the "traditional" macaroni shaped pasta for this dish. At the end of the day it's all about the taste, and the looks too. Well, I can honestly say that on both accounts - I've succeeded! Cheese sauce works very well with the broccoli as well as slightly sharp and acidic tomatoes. The dish is not bland and it has more than one texture, that of the creamy sauce. I didn't have an exact recipe for those fritters. It was a moment. I had some apples, bananas were already getting brown so... I just make up some batter to coat them and fry. The result was amazing. Nice crisp from the outside and soft inside! Banana ones are my favourite. I also wanted to make some pineapple fritters - but didn't have any at home... All you need is a cup of coffee/tea to go with it :) I ate some of them with icing sugar, some with honey - they would be perfect with vanilla ice cream or whipped cream, but then again - nothing in the freezer. Next time tough! 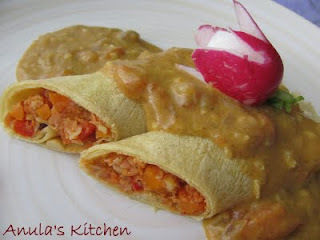 The host of this month's Daring Cooks challenge was Olga from Las Cosas de Olga and Olga’s Recipes. 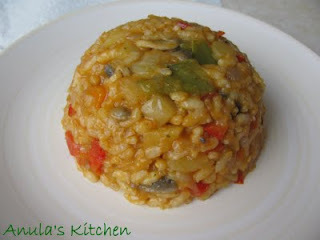 She have chosen a delicious Spanish recipe - Rice with mushrooms, cuttlefish and artichokes by José Andrés, one of the most important Spanish Chefs at the moment. I really enjoyed this month's challenge. It was delicious - my Hubby had 2 BIG portions, accompanied by a pint of Kilkenny... I remember similar dish when I was in Barcelona - I loved it then too :) It was very easy to make, especially if you prepare your Sofregit in advance. The only 'hard work' was with the allioli - over 20 minutes of constant stirring in the mortar - and I wasn't happy with my final result, but it was tasty (the most important thing!). I love cherries! I remember when I used to pick them as a child, fresh from the tree. My Granny would make jams, starch jelly, pies, muffins... Beautiful childhood memories. I can still smell boiling cherries with sugar for jam or marmalade :] I was lucky today and bought a big jar of cherries (already without the stones!). Fresh cherries are crazy expensive here... I was thinking how to use them, carefully and make them last a little longer. Is there a better idea then a pie/cake?!? No. Not for me anyway ;) I'm not sure if it's more of a pie or a cake - better decide yourself. It's hard for me to define this dish. I remember it since I wass a child my Dad used to make it. It's great as an afternoon treat, warm dessert, but sometimes we would have it even as a light, sweet lunch. When I was older, I ate it sometimes as a breakfast, especially on cold, wintry mornings. You can cut the apples into small pieces (like myself), as I like their texture in the rice, or great them, as it's normally done in Poland. A nice twist on the dish would be cooking rice in a coconut milk rather than cow's one, it won't be traditional Polish dish anymore, but another one which is equally delicious! Addition of apricots (which I don't add every time) and raisins, is totally my take on this sweet dessert, and both can be omitted - for more "authentic" taste. The July Daring Bakers' challenge was hosted by Nicole at Sweet Tooth. She chose Chocolate Covered Marshmallow Cookies and Milan Cookies from pastry chef Gale Gand of the Food Network. 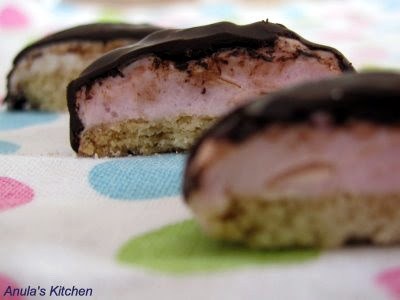 (Have to admit that I didn't make Milan Cookies... you will find the recipe here). Greek food is one of my favourites but unfortunately I'm not confident when cooking it. This recipe isn't mine. It comes from a great website 'Greek Food - Recipes and Reflections' (link to the original recipe can be found here). I love Greek food. My first holidays with my Hubby were in Crete - the biggest Greek Island. The food was amazing. Fresh fruits, veges, lamb and those desserts - all with huge amount of honey... yum! I would love to travel around Greece and try all regional cuisine - maybe, someday... 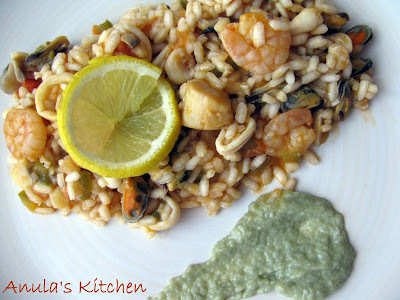 This recipe is very easy and so delicious - you have to try it! Golabki is a dish that's very popular in Poland and it's also one of the most favourite in my family. It's not difficult at all, but a little time consuming (mainly with forming the rolls), then all you have to do is to cook it. The taste, the final result is really very good reason for all that rolling ;) They are great with mashed potatoes and thick, velvety tomato sauce. You can use raw meat, like myself, but I know that many Polish families will use cooked meat - from making a broth etc., hence making golabki very budget friendly dinner. I've also learned that serving golabki with mashed potatoes and tomato sauce - and I really don't know any other way - is really "my family thing", though popular with others too. You can serve them on its own - as you have all "ingredients" of a fully balanced dinner already there: meat, rice and veg ;) Personally I think that simple, plain tomato sauce gives it another dimension, and its acidity goes really well with delicate cabbage. "Gołąbki [ɡɔˈwɔmpki] are a form of cabbage rolls. They are a traditional Polish dish consisting of boiled cabbage leaves stuffed with ground beef, chopped onions and rice or barley; most often baked and refried in a spicy tomato sauce. Gołąbki means pigeons (this refers to the shape of the roll; none of the ingredients have any connection with the pigeon meat known as squab). 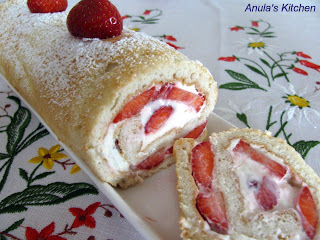 I know that my Hubby had his BDay cake already (you can find the recipe here) but we had guests only yesterday. He got lucky this year and got 2 BDay cakes! I'm too good for him ;) Didn't know really what to make this time, so I came with very easy idea for a very delicious cake :) Luckily for me everyone was delighted and they (me too!) really enjoyed the cake. Not a lot of work involved and it's yummy! As I'm living in Ireland now, traditional 'fish and chips' aren't anything unusual for me. Shop bought versions tend to be very fatty and usually blend in taste. I'm trying to eat a fish minimum once a week - it supposed to be very good for you, so why not give it a try. I had some cod in the freezer so I decided to take a go at this traditional duo. Instead of normal long chips I made some diced ones. It worked out very well and I'm sure I will make it more often. The June Daring Bakers' challenge was hosted by Jasmine of Confessions of a Cardamom Addict and Annemarie of Ambrosia and Nectar. They chose a Traditional (UK) Bakewell Tart... er... pudding that was inspired by a rich baking history dating back to the 1800's in England. 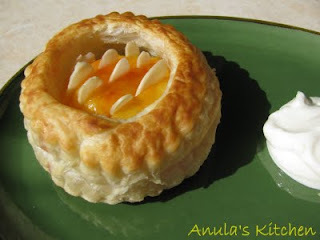 I have to admit that before this challenge I have never heard of a Bakewell tart/pudding. I was very excited as the recipe looked very promising - and I wasn't disappointed :) Bakewell tart/pudding is now one of my favourite desserts! It was easy to make and what an amazing result. I used a blackcurrant jam which was a little tart and went well with the almonds. 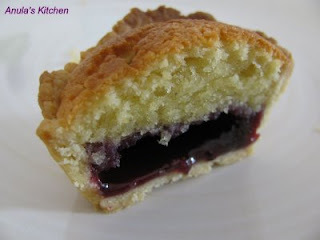 I had some pastry left and I made mini Bakewell tarts - they were very very handy, few bites of a perfection :) for a good mood! This is one of the most famous and traditional cakes in Poland. 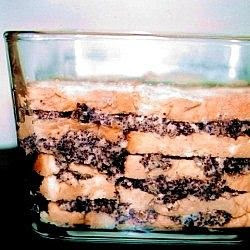 It's called 'babka' or 'babka piaskowa' (sandy cake). It's my Hubby's Birthday today and I wanted to make a real cake for Him - lots of layers, cream, fruits etc. but no... He asked for this one. Fine by me - if it only makes him happy :) It's not difficult, though work consuming (especially if you don't have a big mixer as me...). Hope you will like it. The part with cocoa isn't necessary, so if you like you can skip it. Different idea for a breakfast. I'm working part time recently so I finally have time to prepare something more than traditional cereals and enjoy eating it slowly... This is another memory from my childhood. It's great if you have some stale, sweet roll but really any stale roll/bread will do. In Poland it's called "ciapki" which is really hard for me to translate into English. I was talking to my colleague recently and he told me that his mother used to do that as well. She called it "goody". I'm sure you will like it, if not love it. It's a comfort food for me. Enjoy! This salad doesn't have a name, or I just don't know about it ;) I call it yellow salad - and it's no hard to guess why... It's simple, quick and delicious! Normally you may not think of putting those ingredients together but it really works well. It's a great as a part of lunch - it's ideal to put into small box and take it with you to work/school.